Between being stuck at the Columbus airport on Friday (the 27th) and arriving back in Bonn on Monday (the 30th), I went to my sister's wedding. On Friday, I flew into Chicago at 3pm, went to pick up my dress, check into the hotel, go to the rehearsal, go to the rehearsal dinner, and hang out with a friend and some cousins. 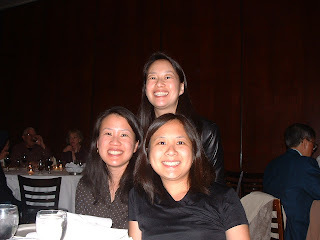 Now people are always surprised that my sisters and I do not look very much alike. In fact, my friend Sarah -- upon meeting my sisters -- remarked that a random woman she's saw once on the train looked more like me. However, we do have one thing in common: the Chen smile. How can you (too!) look like a Chen? It's simple. You take a regular smile, then drop your lower lip a little bit. Voila! Mazel tov. 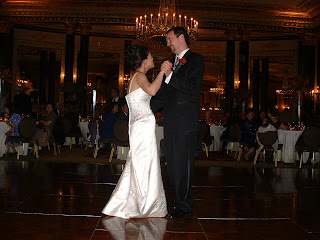 By the way, if you're looking for a place to have a rehearsal dinner in Chicago, the Maggiano's downtown seems like a good bet -- I've now been to two rehearsal dinners there. 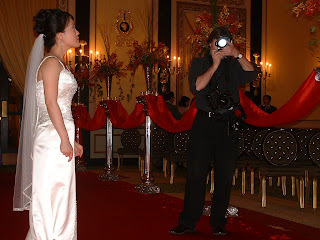 The next morning, we all trooped down to Chinatown and got hair and makeup done, then back downtown to change and start taking pictures. 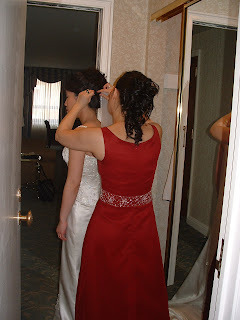 Both my other, non-bride sister and I had hairdos which I would describe as vaguely Wonder Woman on Paradise Island-esque, but it's possible that my memories of TV shows I saw as a kid are inaccurate. The wedding was at the Palmer House, and there were some very nice flowers. I've been to plenty of weddings, but this is the first for my family and it was pretty cool to talk to so many different people, some of whom traveled pretty far to come to the wedding: the groom's family, my sister's high school and college friends, my parents' friends and colleagues, and relatives from both my Dad's and Mom's sides of the family. My Mom is one of eight siblings and on that side of my family (my Dad is one of five, so that's a whole other story), I'm one of 3 cousins who were born in the same year (there's another cousin born within 8 months of me, but in a different year). The other two were at the wedding and both, of course, are doctors. Some more family quirks: the man we refer to as "Uncle Harry" is my grandmother's cousin, making him my second cousin, once removed my first cousin, twice removed [10.05.07: clearly, I've haven't a clue] -- if I understand how that works in English (feel free to correct me in the comments). The man we refer to as "Peggy's father, ... no not that Peggy, the other Peggy" is my grandmother's brother and my great-uncle. The wedding was lovely and went off without the hitch and the reception was very nice also. Congratulations, Jo and Darin. The groom chased around a bunch of my little second cousins (all between 4 and 6 years old), who took a shine to him very quickly. And my parents danced to Black-Eyed Peas, "Let's Get It Started" (What is it with me and that song? And, no, I don't have a good photo of it, although I tried. And, yes, props to my sister's oldest friend, Wendy, who must have some magical persuasive powers.). 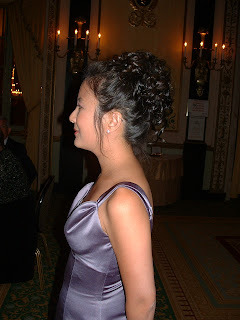 When it was all over, I pulled 26 bobby pins out of my hair, which didn't effect it as much as you might expect, resulting in me looking rather Medusa-like (my hairdo's industrial-strength powers extended to the shower, where the water just bounced off of it). That's an awesome picture of you and your sisters.